Members of the Chicago Teachers Union bargaining unit say they spent hours and hours considering the school board's "serious" contract offer. But today, the group announced that they could not accept it. There were several reasons, but the biggest was money. And not just that the teachers didn't feel the district was offering them enough money, but that they don't feel the board is doing enough to fund schools. They cite the three biggest cost drivers for the district as pensions, debt repayment and proliferating charter schools. 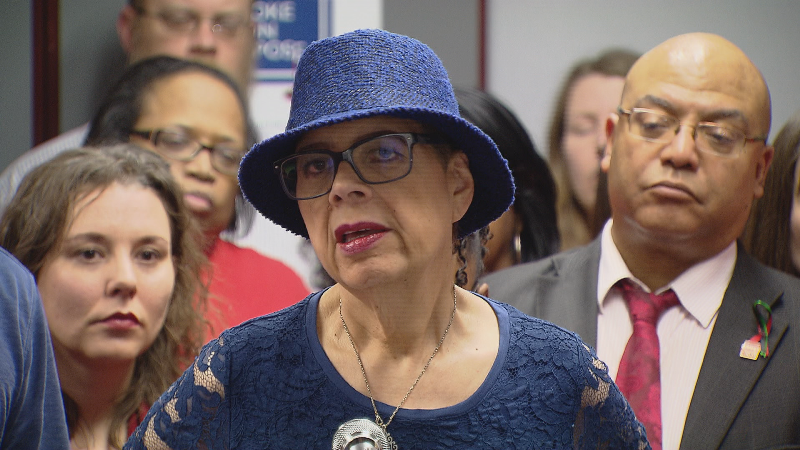 While members of the big bargaining unit and union president Karen Lewis all acknowledge there were some parts of the contract they could appreciate, they just don't trust the district has proven it has or can get the funds to make good on the promises in this contract. The BBU is a 40-member team made up from a cross-section of membership including teachers, paraprofessionals and other staffers. CTU Vice President Jesse Sharkey led the vote, asking members who supported the offer to stand—no one in the room stood up—and those who opposed the offer did stand up. Video: CTU Vice President Jesse Sharkey leads today's bargaining unit vote. This doesn't automatically trigger a strike–the team plans to continue negotiating with CPS. Also, today is the first day of fact-finding, a critical step where an arbitrator looks at proposals from both sides and issues a decision. That has to happen for 75 days, then both sides have another 30 days of "cooling off" before a strike could happen. That means it would be mid-May before the union could call a strike, even though they've already voted to authorize it. The district has threatened massive teacher layoffs if it can't find ways to make substantial budget cuts to close its $480 million gap. CPS CEO Forrest Claypool has said that if the teachers can agree to a contract that would save the district money this year, those layoffs could be avoided. And today, Karen Lewis recognizes that since this offer has been rejected, those layoffs maybe a possibility. But she says it would also mean dire situations in the classroom, like increased class sizes, and she believes there'd be an outcry from parents who want better schools, or who leave the district entirely. Karen Lewis “People have asked us, ‘Well, don’t you have to give up something?’ If you look over the past five years, 10 years, 15 years, we have been constantly asked to give. And we’re looking at about $2 billion if you include the fact that they’ve not paid their pension payments, they took a 4-percent raise, they did a whole lot of other things financially and economically, including this particular piece which supposedly comes out flat but actually harms some of our members,” Karen Lewis said. In order for the board to win back the union's trust, Lewis says, they could immediately declare TIF surplus and use those funds for schools, and support the legislation in Springfield that we talked about last month, the Distressed Schools TIF Surplus Act which would allow a surplus to be applied to a school district in an emergency situation. For now the district says it is committed to returning to the table with CTU for more round-the-clock negotiations. “Despite unprecedented financial problems that threaten our classrooms, CPS reached a tentative agreement with CTU leadership after 14 months of negotiations – including 18 straight days at the end of talks. This agreement provided pay raises, guaranteed job security and met the union's key demands, including restrictions on charter school expansion, raises for seniority in addition to cost-of-living increases, and more classroom autonomy for teachers. That contract offer included $200 million in revenue, as the board committed to restoring 0.26 percent property tax levy for teachers' pensions. It included raises for seniority and experience called step and lane increases, along with cost-of-living adjustments. The district says it's offered the same pension plan as made to the police and fire departments. And it agreed to work toward altering the legislation for the Illinois Charter Commission, which can override a local school district when it rejects a charter. On the TIF surpluses, the district says CPS is receiving $87.2 million of the surplus, and has received $300 million since 2011. No word yet on when negotiations resume. Jan. 28: The union announced a possible breakthrough in contract talks after the day's bargaining session wrapped up. Jan. 22: Chicago Public Schools today gave layoff notices to some administrative employees as part of efforts to reduce its $480 million budget shortfall. "There’s no doubt that these cuts are painful," CPS CEO Forrest Claypool said in a statement. "However, with limited resources and a budget crisis not just this year but into the foreseeable future, we had no choice." Jan. 20: Teachers, parents and the Chicago Public Schools district may not always agree, but on this point they do: leave the management of CPS in Chicago. We hear from education leaders on the GOP plan for a state takeover of the nation's third-largest school district.